Here is the Pavilions Weekly Ad, valid April 17 – April 23, 2019. 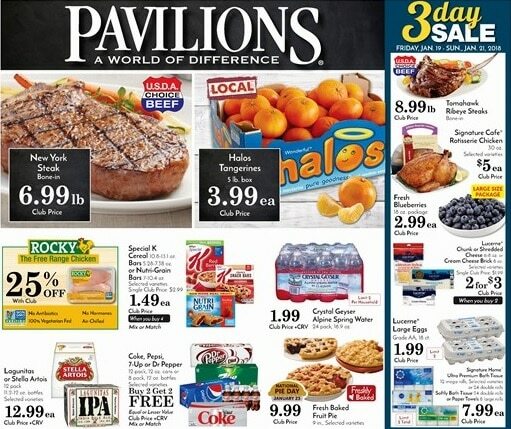 Don’t miss the Pavilions Specials and grocery deals & promotions from the current Ad Circular. Find amazing savings on everything you need to make a great breakfast or dinner like organic vegetables, beverages, cheese, delicatessen meats, fresh fish, canned & packaged foods, cleaning products, deli cakes, dairy, frozen foods, coffee, salad dressings, pasta sauces, snacks, chocolates or ice creams. Save even more when you use the ValuePlus Club Card including benefits like exclusive money saving promotions, digital coupons and discounts on gas at participating locations. Stock up on your favorite staples and also get better nutrition choices with the retailer SimpleNutrition in-store tags.